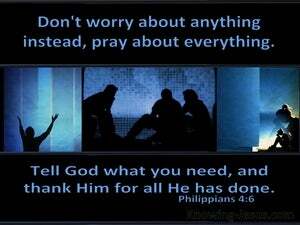 ﻿ Philippians 4:6 Be anxious for nothing, but in everything by prayer and supplication with thanksgiving let your requests be made known to God. Don't worry about anything, but in everything, through prayer and petition with thanksgiving, let your requests be made known to God. Never worry about anything. Instead, in every situation let your petitions be made known to God through prayers and requests, with thanksgiving. 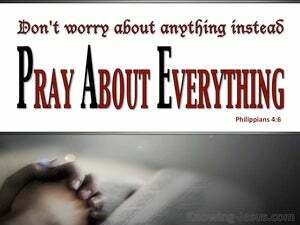 Be anxious about nothing, but in everything by prayer and supplication with thankfulness make your requests known to God. Do not worry about anything, but in everything, by prayer and [special] petition, along with thanksgivings, you should make your requests known to God. the Lord is coming: be not in any manner of sollicitude, but in all your occasions lay your requests before God by prayer and supplication accompany'd by thanksgiving. Be solicitous about nothing; but in all prayer and supplication, let your request be made known to God. Have no anxiety about anything, but make all your wants known to God in prayer and entreaty, and with thanksgiving. Be anxious for nothing, but in every thing by prayer and supplication with thanksgiving, let your requests be made known unto God. Rave anxiety about nothing; but in every thing by prayer and supplication with gratitude let your desires be made known to God. Be not careful: but in all things show your petition unto God in prayer and supplication with giving of thanks. Do not be anxious about anything, but in everything, by prayer and petition with thanksgiving, let your requests be made known to God. 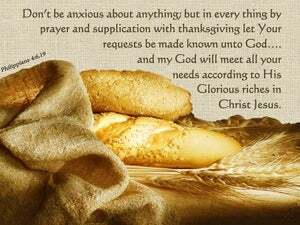 Be anxious for nothing, but with all prayer and supplication with thanksgiving let your requests be made known to God. Be not anxious about any thing, but in every case by prayer and supplication, with thanksgiving, let your petitions be made known unto God. Do not be anxious about anything; but under all circumstances, by prayer and entreaty joined with thanksgiving, make your needs known to God. Be anxious for nothing; but in every thing by prayer and supplication with thanksgiving let your requests be made known to God. Stop being worried about anything, but always, in prayer and entreaty, and with thanksgiving, keep on making your wants known to God. Be anxious in nothing: but in every thing by prayer and supplication with thanksgiving let your requests be made known before God.